When I first saw it, I thought it was honoring fallen soldiers who had fought in Iraq and Afghanistan. 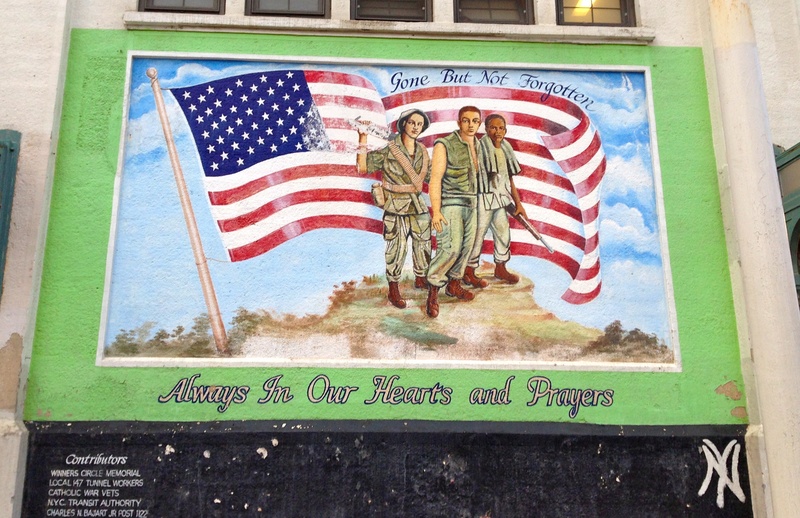 But this mural, at the end of the line on the 4 train at the Bronx’s Woodlawn station, memorializes Vietnam War veterans. It’s been there since 1985, enduring graffiti tags ever since. This entry was posted on May 25, 2013 at 4:12 am and is filed under Bronx and City Island, Music, art, theater, War memorials. You can follow any responses to this entry through the RSS 2.0 feed. You can leave a response, or trackback from your own site. I wonder if this being maintained by any organization. It should be made a landmark. Very moving. Thanks for posting it! Looks good for a 30 year old mural. FYI, the station is just “Woodlawn.” There is no Woodlawn Ave in the Bronx, just the neighborhood/cemetery named Woodlawn. It’s a common mistake, and even the TA had “Woodlawn Ave” destination signs on the Jerome Ave line for many years. Ah, thanks, I’ve deleted the Avenue. When I was a kid in the late 80’s early 90’s this memorial had one white guy, a hispanic and an African American guy. They painted it, I believe early 2000’s the same as the original but updated it with these two black guys and a hispanic dude. Anyone from the area will remember it the way it was, what a shame they did that, I think it is BS and extremely disrespectful…. I concur, Kevin. My father, Al Campbell “The Sign Painter,” is the original artist of this work. I remember him taking great care and pride in painting this mural, and the “updates” over the years have ruined the essence of the mural. The desire to keep it “politically correct” has only tarnished the point of the piece.